The topic of this article ought to handled in short order. When you take a look at the data from Antarctica, it is plainly visible that the ice around the 7th continent has been more or less growing since satellite measurements began in 1979. No sign of melting here. However, you’d never know it from the news we get from this corner of the planet. After all, any report about steadily growing ice simply doesn’t fit the narrative of the growing threat of global warming and the related melting ice caps. Indeed the media never send us reports about the continent as a whole. Rather, they prefer to focus on what is happening on a very small area at the fringes of the South Pole, a northern area of about 0.5 million square km², which represents about 4% of the entire Antarctic surface. For climate science and our media, the Antarctic Peninsula is of decisive importance, as ultimately it is the only place at the entire South Pole where “something is happening”. This region has huge ice sheets, which float on the sea and are mostly connected to the ice on land. Common for these ice sheets is that their tips break off time and again in a natural process known as calving. 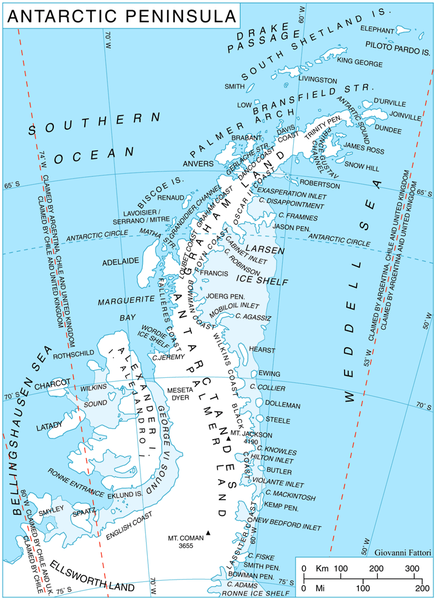 And it just happens that the ice sheets on the West Antarctic Peninsula are everything but static. Since the dynamics of these ice fields have been measured by satellites with increasing precision, it has been observed that these sheets break up and get released into the sea as huge icebergs. According to prevailing dogma, all this can only be blamed on the human impact on climate. Thus year after year we’ve been receiving reports about the imminent collapse of the Antarctic ice sheets. Here are just a few from the German press: 2002, 2003, 2006, 2008, 2009, 2010, 2011. 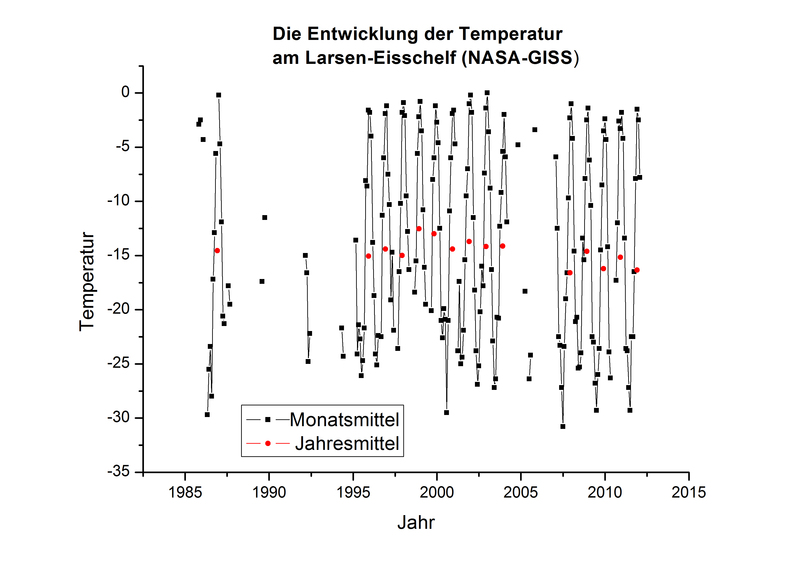 This tradition of yearly alarms continues this year as well, this time from the European Space Agency (ESA), which appears in a report at Spiegel. The evaluation of satellite photos over the last 10 years shows that the Larsen-B-Ice Shelf has lost three quarters of its area. According to ESA, the blame for this is (man-made) global warming. After all, northern West Antarctica has warmed 2.5°C over the last 50 years. So with such claims, it is truly worth taking a look at the measurement stations in this region. Let’s take a look at the results from measurements taken at the Larsen Ice Shelf. We see immediately that the trend is relatively constant, if not slightly downward, since measurements began in 1985. However, the measurements at the Larsen Ice Shelf go back only to 1985, and the ESA press release expressly states a temperature development going back 50 years. So let’s look at the next stations closest to the Larsen Ice Shelf with sufficiently long measurement histories. They are (see charts below) Faraday (since 1944), Rothera Point (since 1946), Bernado O’Higgins (since 1963), Base Esperanz (since 1945) and Base Arturo P (since 1966). All these stations have one thing in common: A “warming of 2.5°C over the last 50 years” is nowhere to be found. And any warming that did occur, did so without exception before 1980. Taking this into account, attributing the break-up of the Larsen Ice Shelf to global warming is already quite adventurous, to put it mildly. 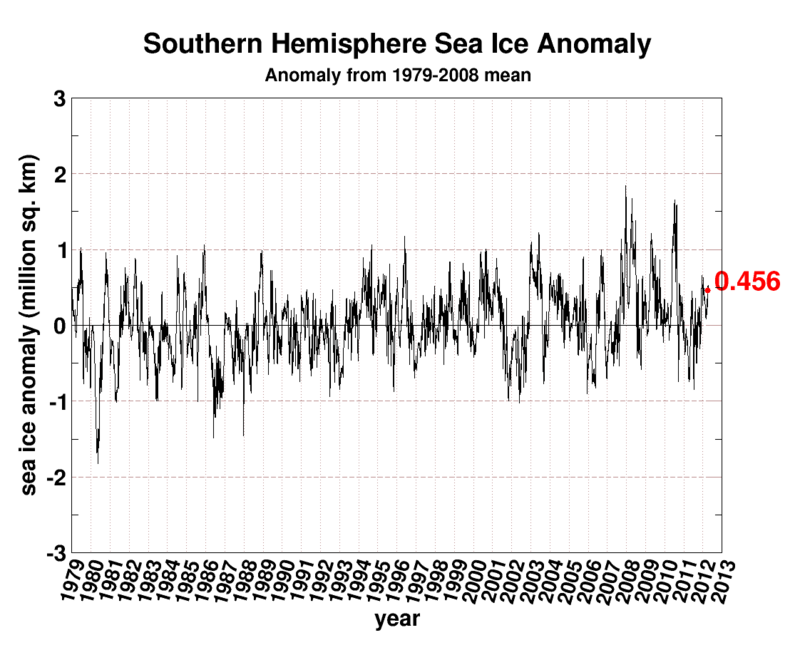 So, how long before James Hansen tampers with this data? When you take the low point at Rothera in 1960 you get 2.5 deg C warming relative to today. The art of the experienced climate scientist is to have enough data to show the desired amount of warming. This means that the originally allocated funding has been consumed, and more EU money needs to be claimed. The EU is probably not willing to give money if the satellite refuses to support EU policies. This would also explain the falsification of the sea level record of Envisat that happened this week. BUT, if Rott and colleagues willingly destroy the data, why did they send up the satellite in the first place. That’s a question only Rott himself can answer. Maybe they understand science as a make-work scheme for themselves. GISS links to stations on Larsen shelf are gone. Hope you saved them, as I did.